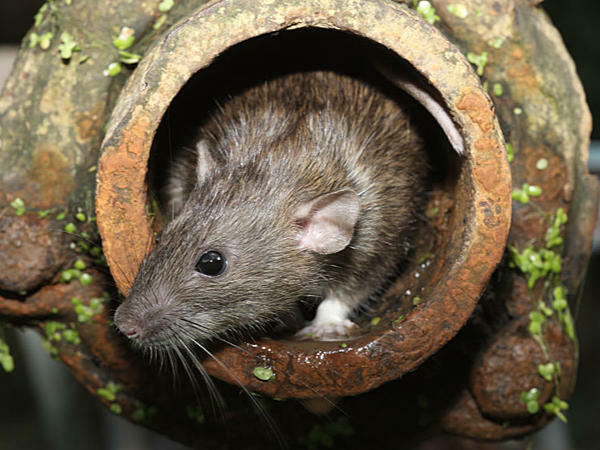 Along with their cousins the roof rats, Norway Rats, also known as brown rats, sewer rats, wharf rats, or water rats, are serious public health pests. Their infamy dates back to biblical times. In the Old Testament book of 1 Samuel, the Philistines were afflicted with "tumors" (sometimes translated as "bumps", "boils", or "lesions") and their land infested with rats after they captured the Ark of the Covenant. The "tumors" could very well have been the bubos associated with bubonic plague, which is transmitted by rat fleas who have bitten infected rats. Norway rats, roof rats, and most other rodents are capable of serving as reservoirs for the bacterium Yersinia pestis that causes plague. 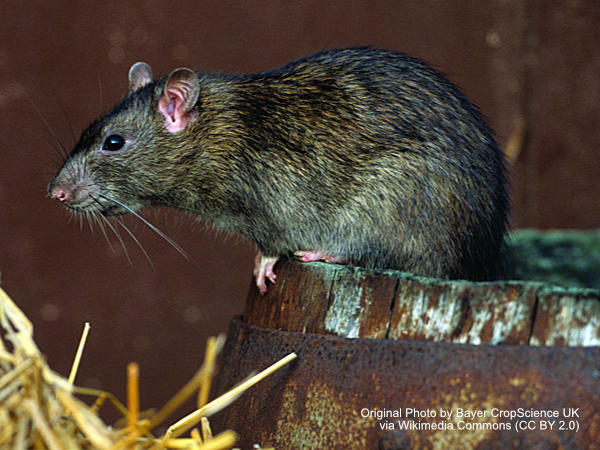 In addition to plague, rats have also been implicated in the transmission of salmonella, Lyme disease, murine typhus, rat-bite fever, and many other diseases, making rats one of the deadliest disease vectors in the natural world. Just in case carrying deadly diseases weren't bad enough, rats also contaminate our surroundings with their urine, feces, and parasites; cause untold millions of dollars in fire damage every year when they gnaw on electrical wires; and can inflict painful, disabling bites with their powerful jaws and razor-sharp teeth. Norway rats are brownish or gray in color and can grow to lengths exceeding 18 inches (about 46 mm) when the tail is included. They weigh between seven and twelve ounces (about 200 to 340 grams) on average, but can sometimes grow to more than a pound (about 170 grams). Being burrowing rodents by nature, Norway rats often excavate burrows in the ground in fields, under or into sheds or buildings, at the base of trees, and under rocks. But they also make themselves at home in abandoned buildings, basements, garbage dumps, sewers, around garbage dumpsters, in abandoned cars and trucks, and pretty much anywhere else they can find food, water, and relative seclusion and protection from predators. Norway rats are very good swimmers, have good balance, can climb well-enough when need be, and are comfortable on ledges, pipes, and other narrow horizontal surfaces. They also have excellent senses of hearing, smell, touch, and taste, which makes it challenging to develop rodenticides that are palatable to them. Their vision, however, does not seem to be very sharp beyond a few feet, and they are believed to be color-blind. Like most rodents, Norway rats have impressive reproductive potential. They reach sexual maturity at the age of three months, on average, and adult females come into estrus every four or five days. The gestation period lasts about 23 days, and there are an average of six to twelve young in a litter. Females may have as many as six litters in a year, successfully weaning about 20 to 30 young every year, on average. This can result in a small rat problem very quickly becoming a big rat problem. Rats in urban areas usually live in packs, but there's no evidence of sufficient cooperation to characterize them as social animals. Like all mammals, mother rats care for and defend their young and sometimes will defend other rats' young, but that's as far as anything resembling cooperation goes in the rat world. The rat pack phenomenon is more common in cities than in rural areas, where rats tend to be more solitary. In urban areas, rats usually live in or near sewers, abandoned buildings, or other places near sources of food and water. Because these needs are the same for all rats, their presence in packs more likely is a result of rats in general being attracted to the same kinds of areas, rather than of any particular fondness on the rats' part for living in groups. Adult male rats are territorial and will often chase away other males (including their own sons once they approach maturity) with aggressive posturing, shreaking, and other behaviors. Much has been written about Alpha, Beta, and Gamma rats, which supposedly represent three levels of dominance of males in a rat pack (with Alpha rats being the most dominant). Because much of this research was conducted under artificial conditions using captive rats, it's questionable how well it actually represents wild rat behavior. In the wild, territoriality and dominance among rats seems more a function of age and size than of any particular "personality" traits. However it works, however, any significant increase in the number of rats in a given area always results in an expansion of their geographic range, on both the micro and macro levels. In other words, when the rat population in a basement gets too big, the infestation will spread to the upper floors of the building; and when the rat population in a village gets too big, the infestation will spread to neighboring areas. This makes cooperation essential to the success of wide-area rat control programs. Norway rats are also xenophobic, which means that they are cautious about new objects in their environment and tend to avoid them for several days. This has important implications for rat control because rats typically will avoid traps or bait stations for several days after they are placed, and will permanently avoid them if their first contact resulted in sickness or narrowly escaping capture or death in a trap. Most exterminators get around this trait by "pre-baiting" rat traps for a few days by baiting them but not setting the triggers (or by tying the doors open on cage traps). Then once the rats have lost their fear of the traps, they're all set at once, usually resulting in a large number of rats being caught. 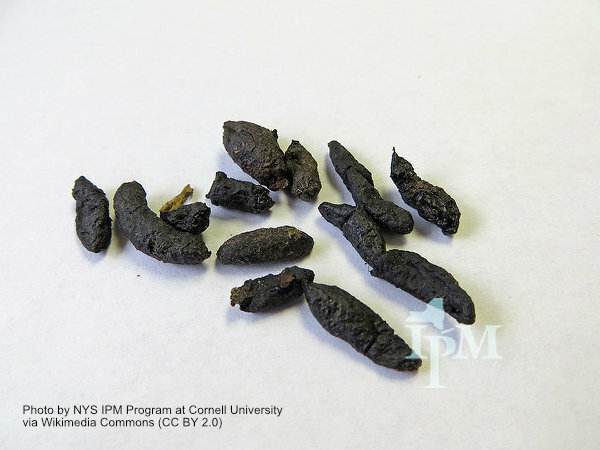 There also are non-toxic versions of many rodenticides that allow the rats to become accustomed to eating the bait, after which it is replaced with the actual rodenticide.